Star players from two-time defending national champion Bishop Gorman and Texas prep powerhouse Cedar Hill spent plenty of time trash-talking each other heading into Saturday night’s nationally televised season opener at Longhorn Stadium. In the end, it was the Gaels (1-0) who proved convincingly that they could talk the talk and walk the walk. Ohio State-bound quarterback Tate Martell and Cal-bound running back Biaggio Ali Walsh each rushed for three touchdowns and senior safety Bubba Bolden and sophomore corner Greg Oliver both came up with interceptions to lead Bishop Gorman, ranked No. 3 in USA Today’s Super 25 rankings, to a 44-14 blowout of No. 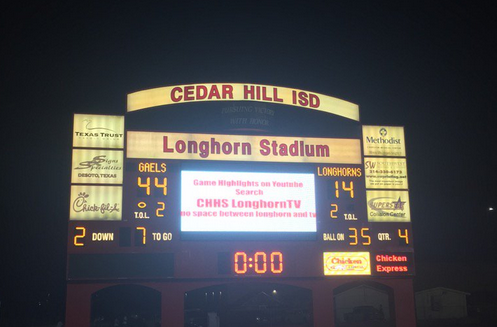 5 Cedar Hill in the GEICO ESPN High School Kickoff. It was the 40th consecutive victory for the Gaels. Bishop Gorman finished with 507 total yards and 25 first downs compared to just 250 yards and eight first downs for the Longhorns (0-1), who claimed high level Texas state titles in both 2013 and 2014. Bishop Gorman led 17-7 at halftime before Cedar Hill cut the deficit to 17-14 early in the third quarter on an electrifying 72-yard fake punt by Marquise Foreman. But it was all Gaels after that. Ali Walsh, who finished with 198 yards on just 18 carries, broke loose for a 77-yard run up the middle to make it 24-14. Martell, who finished 10-of-22 passing for 135 yards, took over from there, ripping off touchdown runs of 13, 34 and 49 yards en route to 148 yards rushing on 18 carries. Gorman’s defense also had big games from Ohio State-bound defensive lineman Haskell Garrett, UNLV commit Farrell Hester and junior Palaie Gauteote at linebacker and corner Alex Perry. The Gaels limited Cedar Hill quarterback Avery Davis, a Notre Dame commit, to just 19-of-33 passing for 158 yards, one touchdown and two interceptions. Moments after the final gun, Martell, the object of some of the nastiest tweets from the Lone Star state after he de-committed from Texas A&M and switched to the Buckeyes, headed back to Twitter to get in a few more digs. One said “TEXAS WHO?” and another had a map of the United States with the state of Nevada laid over Texas. Both were deleted a few hours later. Bishop Gorman, which played without star wide receiver Tyjon Lindsey (broken collarbone) returns to action on Friday night when it hosts one of the top teams from Florida, Cocoa High, at 7 p.m. at Fertitta Field.